I have drunk many, one at least two dozen bottles of this wine. Most have been good, some have been soapy, one has been corked but this bottle was - perfect! Since 1999, the storability of Alsace wines have improved. This is mainly due to the current corks are so much better, but most likely because of better understanding of how to optimize the balance between oxidative and reductive phases from fermentation until the wine is bottled just before the next harvest. 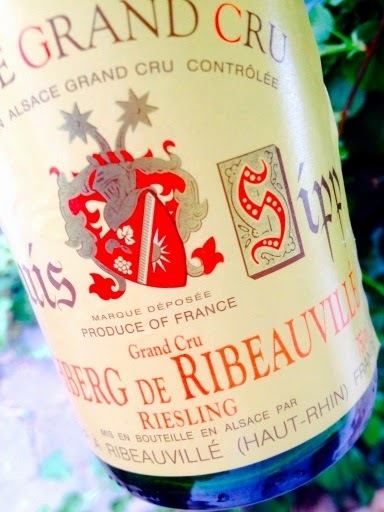 1999 Riesling Grand Cru Kirchberg from Louis Sipp in Ribeauvillé has a healthy yellow color with a little hint of green. The aroma is big but not excessive, offering mango, grapefruit and heather. The flavor is rich, complex and somewhat acerbic and gives the impression of being completely dry, despite the overwhelming and smooth fruit that remains in the mouth for a long, long time. Who would have thought that this wine is 15 years old? Price: € 20.